The VitroGLO-UPTC is a NEW generation of Low NOx gas burners for application to a Regenerative Glass Melting Furnace. Based on the Global Combustion VitroGLO-UP Gas burner and installing on the same underport bracket, these burners are designed to operate at a low gas supply pressures, and provide a highly luminous adjustable flame within the melting furnace. A key feature of the VitroGLO-UPTC Gas Burner is that the flame length is adjustable (by up to 30%) by means of proportioning the velocities of two concentric gas jets in the visible flame, thus optimising the flame length within the furnace with ease and without the need to change the gas nozzles. On the VitroGLO-UPTC gas burner, this is controlled by adjusting the proportion of the individual gas supplies, and by adjustment of the impulse nozzle position in relation to the main nozzle. In Underport firing applications, a high degree of flame coverage can be achieved, which with the high luminosity generated by the VitroGLO-UP Gas Burner, maximises the heat transfer to the glass, and minimises NOx emissions. 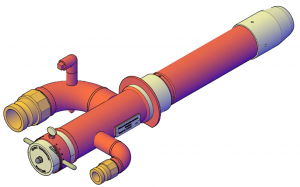 The underport system incorporates a burner sealing system, which eliminates tertiary air and provides burner cooling to increase the nozzle operational life. The burner support bracket both supports and fixes the seal ring in place against the burner block. For underport applications, Global Combustion can provide both water cooled or air cooled block sealing systems. Global Combustion provide two types of burner support bracket, depending on whether the bracket is to be supported from above or below the burner block. Support from above has the advantage of allowing clear access to the flux line. Both bracket designs provide simple vertical angle adjustment with an easily visible reference scale, allowing the flame position to be optimised withing the furnace. The mechanism provides accurate burner location, and allows for quick and safe removal of the VitroGLO-UPTC Gas burner. Global Combustion can supply the VitroGLO-UPTC gas burner for retrofitting to an existing burner installation. The VitroGLO-UPTC gas burner is interchangeable with the Global Combustion’s VitroOIL-UP Fuel Oil Burner. Global Combustion Systems can also provide auxiliary control equipment, including the fuel gas control system, and full supervision and commissioning services.